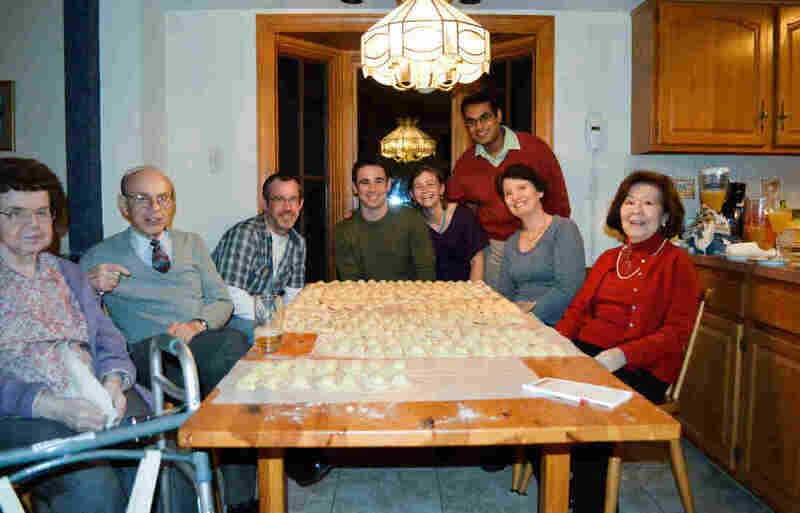 Grandmother's Pierogi-Making Tradition Lives On For Christmas Eve : The Salt Sometimes it takes years to get a family recipe right. And in the meantime, new holiday traditions emerge, like arguing over how to seal "Grandmom's" Slovakian pierogi perfectly. The author and her family gathered around their prized Christmas Eve pierogi in 2012. On the far left is "Grandmom" Cecelia Beans. In 2004, after three decades of serving Slovakian-style holiday dinners, my grandmother declared that she was done. Since no single person could match Grandmom's culinary prowess, the rest of the family did our best to divide up her dishes. For our Christmas Eve meal, my father learned to make the opening course — a lima bean soup. We purchased the dessert, a nut roll called kolachi, from a nearby Ukrainian church. For our main course, pierogi, I took the lead. I was entirely unprepared. Pierogi look simple enough. These half-circle-shaped dumplings are made from dough stuffed with filling and boiled. The filling varies across the Central and Eastern European countries where pierogi originate. There are savory fillings like sauerkraut, meat, or mushrooms, and sweet ones like apricot or cherry. We stick to two classics — cheesy mashed potatoes and prune. Each member of the author's family has a go-to way to seal pierogi. As is traditional in many Slavic families with Catholic roots, my grandmother made meatless pierogi on Christmas Eve, having learned the tradition from her mother, who learned from hers. She made pierogi only on Christmas Eve, because it was just too much work to muster the energy for on any other day. 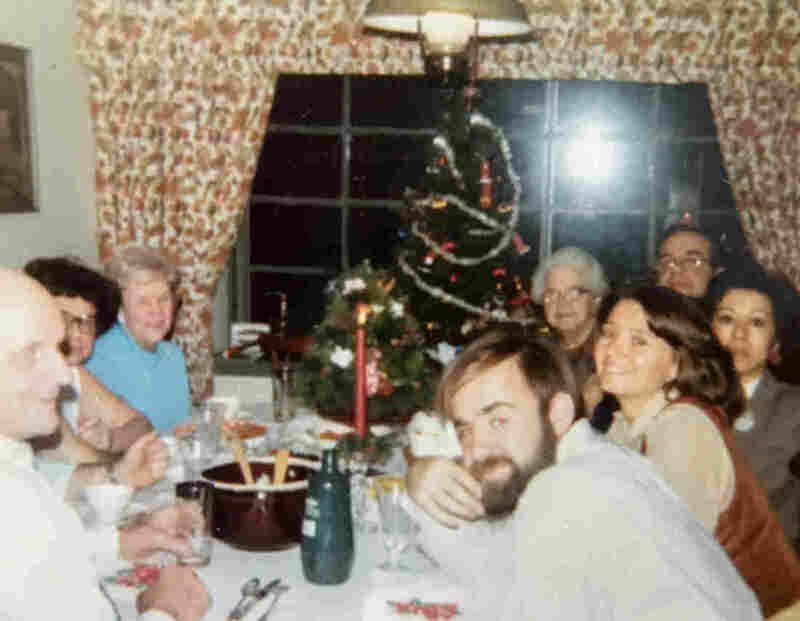 With lights dimmed and candles lit, a dozen of us spanning four generations passed bowls of pierogi around the table as Christmas songs played in the next room. Grandmom sat closest to the kitchen, ready to hop up the instant she noticed the melted butter — our sole pierogi topping — running low. I sat next to my brother, three years younger, as he attempted to consume one pierogi for each year of his life — a tradition that, remarkably, he maintained through age 15. 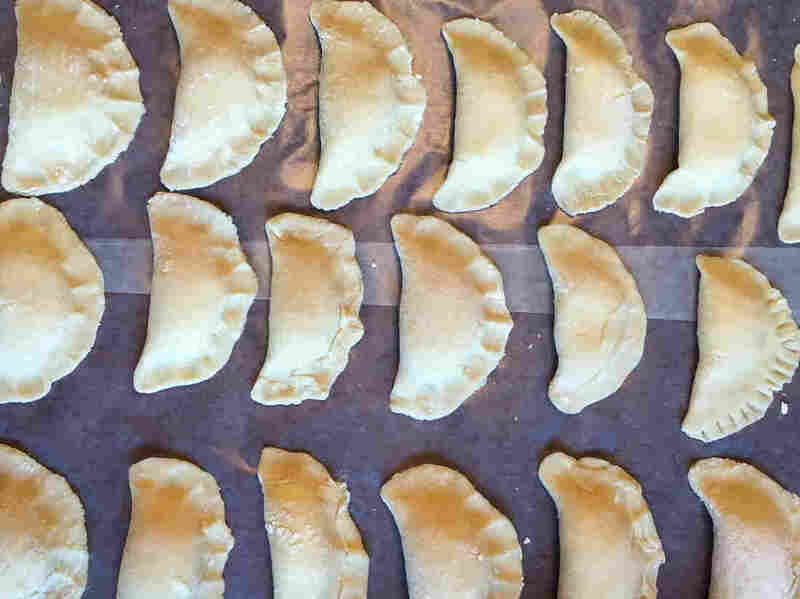 I was passed the pierogi reins over the next in line — my father and his two brothers — based on very limited qualifications: As a 13-year-old, I had once spent the day of December 24 in my grandparents' kitchen. While others had pinched a few pierogi closed over the years, I was the only one who had watched from start to finish. But "watched" was the key word. My grandmother was a perfectionist. (I always smile when I get to the end of her carrot cake recipe and find her handwritten note: "Don't overbake or under bake.") And she worked quickly. She had a couple of hundred pierogi to make, plus the lima bean soup and a turkey dinner for the following day. Any attempts I made to pitch in felt like getting in the way. She coached me through kneading a couple of batches of dough and then she and my grandfather — an expert pierogi sealer — took it from there. Ten years later, I stood in my parents' kitchen, attempting to replicate her ritual. First, there were the fillings. The prune was simple — I steamed some prunes. I couldn't find the potato filling recipe, and my grandmother was no longer in a position to offer instruction. So I whipped up some mashed potatoes and folded in slices of Cooper Sharp American cheese until it tasted like hers. It was noon. In five hours, our guests, including my grandmother, would arrive. I laid her dough recipe and the ingredients on the kitchen table. My brother stood by, ready to roll out the dough and cut out circles with a coffee tin because I had a vague memory of my grandmother doing the same. I mixed the dry ingredients in a bowl, followed by egg, melted butter and warm water. My hands went in next. And, to my amazement, the feeling was familiar. As the dough transformed from sticky paste to a smooth, stretchy ball, I was transported back to Grandmom's kitchen and the feeling of her hands training mine to fold the dough over and push it back down. I was pretty sure I'd nailed it. My brother rolled and cut out the dough. I tucked some potato filling into a cutout and pinched the edges as I'd seen my grandparents do. I made more dough. My mother, father, and uncle joined in the pierogi pinching. And four hours later, we had done it, or so we thought. Grandmom walked in to find 100 unboiled pierogi in rows on the kitchen table. My great uncle asked if we'd bought them from the Ukrainian church. "We made them," I said, and watched as my grandmother's eyebrows rose in delight. But pierogi victory was not ours that year. Either I imagined the coffee tin or my grandmother had used a smaller one, because these pierogi, once boiled, swelled to massive proportions, with the filling seeping out into the boiling water. That night, we ate sad empty pockets of rubbery dough. I felt frustrated that my grandmother hadn't taught me her techniques. But I finally understood why she was so insistent on getting every step exactly right. Keeping pierogi on the table was a way of keeping a defining part of Grandmom — and our family — in our lives. But the weight of holding up that tradition felt enormous. I wanted to get it right. The next year we fixed the size issue by swapping the coffee tin for a pint glass. The following year we perfected the texture by rolling the dough thinner. But far too many pierogi still spilled their contents. There had to be something wrong with our sealing technique, and we all had ideas about how to fix it. My father crimped the edges with a fork. My brother rolled the edges, then crimped. My mother pinched as I did, but never as uniformly as I wanted her to. In later years my husband joined in, also a subscriber to the fork-crimping school. We looked at each other's pierogi with suspicion, and were each convinced when a filling-less pierogi made it to the plate that someone else's technique was to blame. Channeling my grandmother, I wanted everyone to keep their hands off the pierogi. But the truth is, I needed their help. And eventually, the great pierogi debate became part of the tradition. Then, last Christmas Eve, after 12 years of trial and error, I noticed a step in the recipe that I had overlooked. Soon after dropping pierogi into the boiling water, we were supposed to reduce the heat. We adjusted the temperature and lost not a single one. They weren't as tasty as hers, but they were darn close. I wish Grandmom had lived to see us get our family dish right. She died four years ago. "Christmas Eve dinner was her thing and the pierogi were the star of the show and they couldn't be wrong. That was unacceptable," my uncle recently recalled. This Christmas Eve, I expect the pierogi to turn out fine. But if they don't, I've learned that for our family what is most unacceptable is Christmas Eve without pierogi, however imperfect they may be. I think my grandmother would agree.